This image was taken on my first night out following the street light switch-off in the nearby towns (between midnight and 5:00am), helpfully the moon was also on the opposite side of the sky by this time. 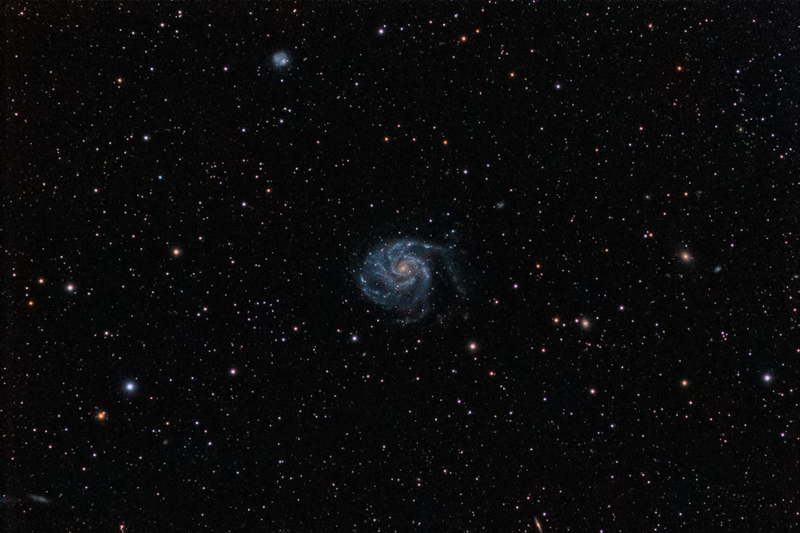 As you can see, I have also also managed to capture a fair few of M101's companion galaxies in this image, including NGC5474 just left of top centre. This is also the first image I have processed using PixInsight's new 'Masked Stretch' process (released this week, replacing the old script version). It has made a massive difference to retaining colour in the cores of the stars and the galaxy, so much so that I may well have to go back and reprocess some of my earlier images which suffer from a lack of star colour (a common problem with DSLR images).